Youth Alive prides in the Education for Life (EFL) curriculum as the back bone for foundational skills. This is an integrated training development model rooted in the social change theory. This model was designed using the Gerald Egan’s skilled helper work. It is adaptable for both in school and out of school groups. The model therefore seeks to move person(s), groups (peer support clubs/associations) and communities towards actions that lead to healthy and proactive life styles. We provide young people with knowledge and skills in financial literacy, business planning, and entrepreneurship and later link them to vocational institutions and local artisans for more NFE practical skilling. We promote agricultural value chain skilling and non agricultural including carpentry, mechanics, metal work and beauty skills for the girls. The local artisans mentor the young people to achieve their potential. 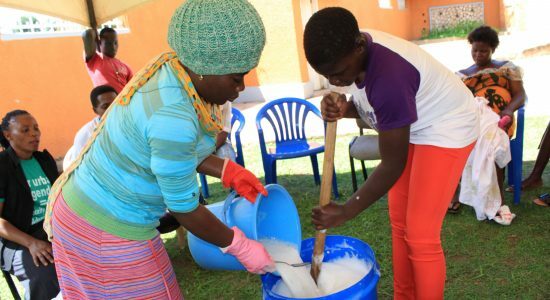 Teenage mothers attain liquid soap making skills.